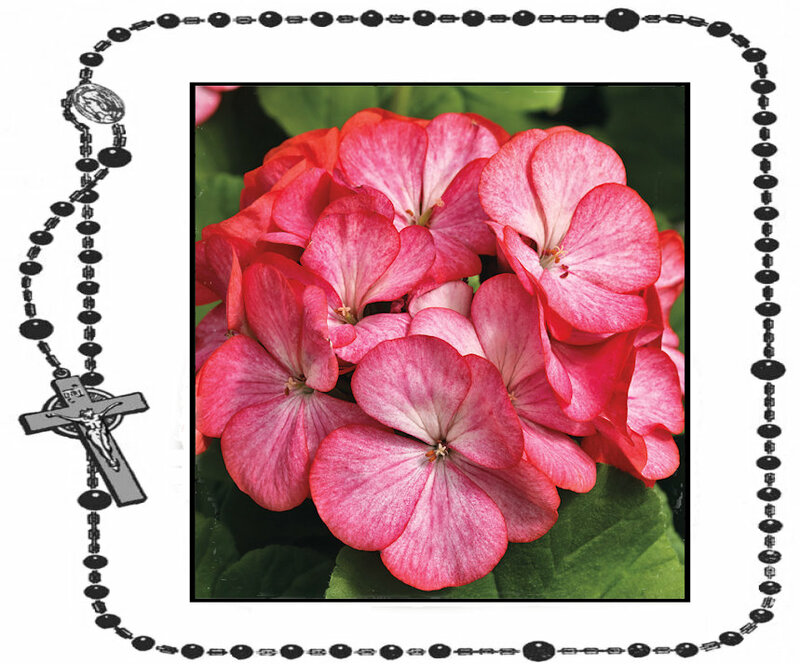 Each day of May there is a special flower dedicated to Our Lady which corresponds with a particular virtue. When you offer to Mary each day of May the acts of the designated virtue, you will have presented her with a most beautiful spiritual bouquet of flowers by her glorious feast on May 31 of the Queenship of Mary. These are taken from the book Our Lady by Father F.X. Lasance; the same who produced the Father Lasance Daily Missal, as well as a plethora of other traditional works. On the first day of Mary's month of May was the Feast of Saint Joseph the Worker, Mary's earthly spouse. The designated flower is the LILY and the designated virtue is PURITY. No flower is more significant in identifying the Foster Father of Jesus and chase Protector of Mary than the holy Joseph whose feast we celebrate and who is the symbol of purity, most always depicted by the pure Lily. On the second day of Mary's month of May, a ROSE is presented to represent LOVE OF GOD. No one loves Go more than His Blessed Mother Mary, who humbly became the Living Tabernacle of the Holy of Holies. Mary is associated with the rose because it is one of the most beautiful flowers and all of her special prayer - the Rosary - is a bouquet of spiritual roses that we can offer her each day for her to take to the Holy Trinity in intercession for us as our Heavenly Mother who loves us so much. On the third day of Mary's month of May, the MYOSOTIS is presented to represent THANKSGIVING. This bluebell-like flower is most appropriate for some say it was the only thing that bloomed on Calvary after the Crucifixion of our Lord and Savior. If we should offer thanksgiving for anything, it is for the ultimate Sacrifice on the Cross in which we are saved and which is re-enacted daily in the Holy Sacrifice of the Mass. On the fourth day of Mary's month of May, the feast of Saint Monica, the bouquet offered the delicate, colorful PANSIES which represent the virtue of THOUGHTS OF HEAVEN. Few exemplified this virtue better than Saint Monica who spent every hour of her day praying and sacrificing for the conversion of her son, Augustine. She constantly had thoughts of Heaven in her mind, heart and soul, praying so wholeheartedly for the spiritual welfare of her son who had gone astray. The pansies of persistence paid off as we know and Monica lived to see her son become a religious. All she had prayed for came true. So also with us if we offer Our Lady our pansies of heavenly thoughts, she will intercede before her divine Son and answer our prayers. On the fifth day of Mary's month of May, the feast of the holy Sovereign Pontiff Pope Saint Pius V the flower contributing to the bouquet offered to the Blessed Mother is the MARGUERITE which represent SIMPLICITY so perfect for this holy saintly Shepherd who, through his infallible decree Quo Primum, sought to make worship to simple with the in-frangible Mass of all Ages - the Apostolic Latin Holy Sacrifice of the Mass set in stone by the dogmatic Council of Trent and codified by his holy Pope for all posterity. How simple can it be? This is the way it is as Saint Pius laid out in following the infallible tenets of Trent, and all one needs to do is follow those rules and rubrics. Simple! But it is the devil who complicates things and therein we can see his complicity in Vatican II and how Our Lady has wept so at so many who have apostatized from her divine Son's Church. On the sixth day of May, the Feast of Saint John Before the Latin Gate, is devoted to the virtue of HUMILITY and represented by the VIOLET. This is so appropriate considering the great humility of the beloved disciple who took Mary as his Mother at her Divine Son Jesus' dying request on the cross, to look after her and care for her. Humility is something so lacking in so many of us and so necessary for sanctity. The beloved disciple, John, possessed this virtue throughout his life and in his inspired words of Sacred Scripture. It was this humility that prompted God to choose him as Mary's protecter and also preserved him from the boiling oil and afforded him, through the Mercy of God, to be exiled to the Isle of Patmos where he received the final account of the final days in the Book of the Apocalypse and was the only Apostle not to die a martyr. The seventh day of May is the Feast of Saint Stanislaus Kostka, Bishop and Martyr. The virtue is ATTACHMENT TO GOD and is represented by the BINDWEED which is truly not a weed, but a flower that is stately just as Saint Stanislaus remained attached to God despite the pressure of his fellow Poles and even the King. He had only one King: Christ the King, ever remaining the loyal subject and attached always to God. If one has a fervent attachment to God and seeks to do His divine will, one will always be joyful no matter what slings and arrows life and the devil fires at his soul. For the eighth day of May and the Double Major Feast of the Apparition of Saint Michael the Archangel, the virtue is FAITH and the greatest warrior in Heaven for defending the Faith is the noble winged general. The flower symbolized was the IRIS which blooms in the Spring and we must spring forward with faith to uphold and spread the True Faith, being irises who bloom where they are planted. Just as the iris is so functional to the eye, we must be on our watch against the wiles and snares of the devil. Count on Saint Michael the Archangel - Quis ut Deus - He who is like God - to be our defense against satan who seeks the ruin of souls. For the ninth day of May, the flower is the majestic MIGNONETTE with the corresponding virtue being the PRACTICE OF HIDDEN VIRTUES. Appropriately it is the Feast Day of Saint Gregory Nazianzen, the holy Bishop and Doctor of the Church who was a vaunted defender of the Faith against the Arian heresy and practiced the Hidden Virtues in winning souls to the True Faith while traversing the rocky regions of Constantinople near the Mediterranean where the Mignonette blooms forth abundantly with its spike-like clusters of greenish or yellowish white flowers. The Mignonette emits an intense spicy fragrance, at first hidden from the one's senses until closer to it, just as practicing Hidden Virtues may not be evident to all until they are exposed to the virtuous life of the person for "By their fruits you shall know them" (Matthew 7:20). 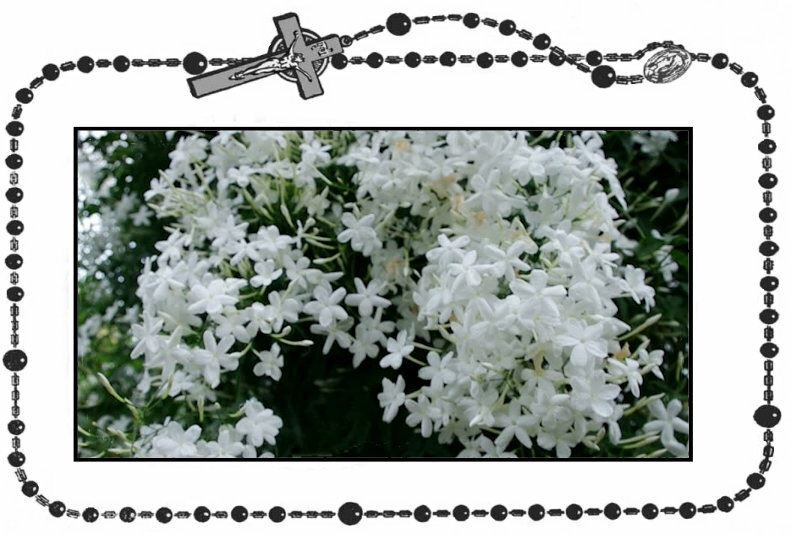 On the tenth day of May, SWEETNESS is the designated Virtue with the corresponding flower for Mary's bouquet being the delicate JASMINE. On this Feast of Saint Antoninius it is appropriate that the Jasmine, a fragrant white or yellow flower, employed to flavor tea or in perfume, is the flower of the day since Saint Antoninius, as the Archbishop of Firenze, sought to extinguish the noxious fumes of the false Renaissance with the love of truth and encouraging his flock to study and do penance whereby the sweetness of the fragrance of truth emanated through in souls being saved. Truly pure sweetness! On the eleventh day of May, the flower is the beautiful PINK ROSE with the corresponding virtue being PRAYER. 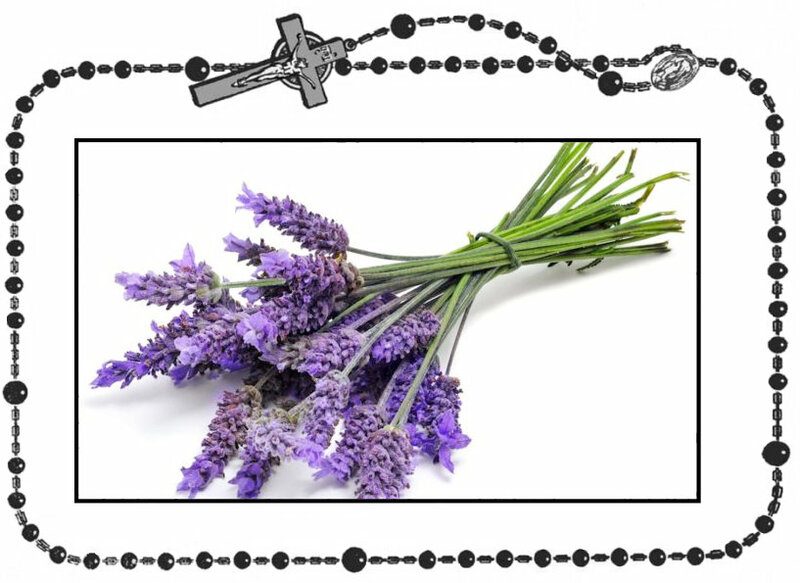 How appropriate that outside of the Holy Sacrifice of the Mass, the most efficacious prayer is Mary's Holy Rosary. The pink rose so magnificently expresses Our Lady's true femininity and divine motherhood. 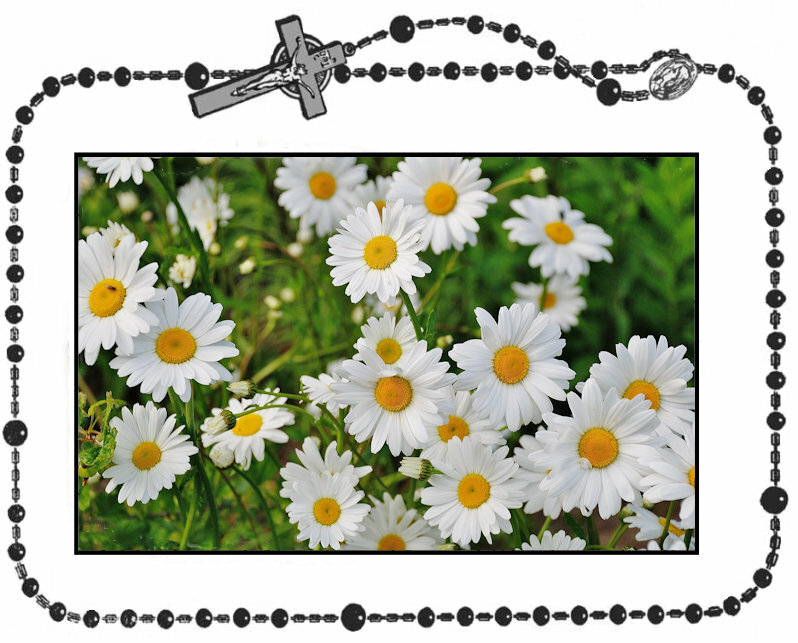 Her Rosary, which she herself bestowed to Saint Dominic, is a spiritual bouquet of roses we can offer daily to Heaven; a spiritual bouquet built upon the ancient prayers of the Psalter - 150 decades for the 150 Psalms of David the Prophet. On the twelfth of May the flower offered to Our Lady is the tube-like HEATH-FLOWER with the corresponding virtue being RECOLLECTION. The Heath-Flower comes from the Greek genus Epacris - meaning "upon the hill" where it grows. Many believe it sprouted on Calvary but this has not been proven. Yet, it would be appropriate for the Virtue of Recollection is centered on the Sacrifice of Christ upon Golgotha, where His Blessed Mother stood faithfully to the end. So also are we able to stand with her through recollection of the Mysteries of the Cross. Appropriately, today's feast of Saints Nereus and Companions focuses on this beginning with the Introit Ecce oculi - "Behold the eyes of the Lord are on them that fear Him, hoping in His mercy." 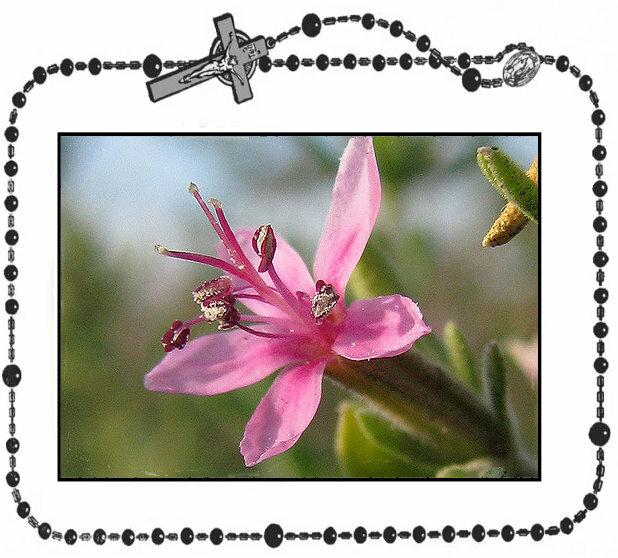 As the Heath-flower hangs down like a religious' habit, so to speak - such as a monk in a monastery - to remind one to put on the garments of God in humility and recollect so also practicing the Virtue of Recollection promotes one to look within the soul and seek in all humility to think of spiritual rather than temporal things. For the thirteenth of May, the flower is the LAUREL blossom with the corresponding virtue being LOVE OF DUTY. What a perfect day for this for it was the love of duty to the Church and Christ's Vicar on earth that promoted Saint Robert Bellarmine to become a Jesuit priest and then to utilize all his God-given talents for the greater honor and glory of God and His Holy Church. Likewise, Our Lady appeared near the Cova and a copse of trees where Laurel blossoms might be found and her message was to remind her children of our duty to pray and to obey her Divine Son. She instilled in the Fatima children, and from them out to all mankind, the importance of the virtue of Love of Duty. We have a duty to spread and live all Our Lady imparted and which is officially approved as worthy of belief by Holy Mother Church. For the fourteenth day of May, the flower offered to our Blessed Mother is the PASSION FLOWER with the corresponding virtue being SACRIFICE. How appropriate this was when it was Mother's Day for a true mother personifies sacrifice, great and small, being the personal conduit of children from the womb to the tomb, entrusting them to God and sacrificing so much with her husband in striving to do God's holy will. The greatest sacrifice was the Passion of our Lord, which was the greatest sacrifice that resulted in the blossoming of souls through salvation for all who followed Christs's teachings. Let us remember also the Holy Sacrifice of the Mass - same sacrifice as that of the cross, for the victim is one and the same, namely, Christ our Lord, Who offered Himself, once only, a bloody sacrifice on the altar of the cross. The bloody and unbloody victim are not two, but one victim only, whose sacrifice is daily renewed in the Holy Sacrifice of the Mass when the bread and wine are confected into the Body and Blood, Soul and Divinity of Jesus Christ in the Holy Eucharist. This continual Sacrifice is carried on in obedience to the command of our Lord, "Do this in rememberance of Me." There is no bouquet more pleasing to His Blessed Mother than worthily assisting at Holy Mass where our souls should open wide like a Passion Flower to embrace our crosses sent so lovingly by the Almighty. Carrying our cross daily is what sacrifice is all about so that grace will flower forth, so abundant in the Holy Sacrifice of the Mass. For the fifteenth day of May, the flower offered to our Blessed Mother is the whispy MIMOSA with the corresponding virtue being GENEROSITY. God loves a generous heart and one who loves God and seeks to do His holy will at all times cannot help but being generous in all things, illustrated in the stamen of the Mimosa flower, fanning out in ray-like fashion to receive the graces God grants to those who are open to them and practice the cardinal virtues as well as the various virtues illustrated in this, Mary's special month, for she is the Queen of May. It is only natural that everyone would want to be generous to the Queen for that brings great favor from the King, who is, of course, her divine Son, Jesus Christ, to Whom we owe all allegiance, all fidelity, all our love and generosity. For the sixteenth day of the month, the flower is the LILY OF THE VALLEY with the corresponding virtue being PUNCTUALITY. The purity of the Lily of the Valley can be equated with the parable of the Five Virgins who were punctual and had their lamps lit when the Master came; whereas the other five foolish virgins were not punctual and because they were not, missed out on eternal bliss. That is why punctuality in all things is a virtue so that we will always live in the state of sanctifying grace and like the snow-white Lily of the Valley, be ready when God decides to take us out of this Valley of Tears. 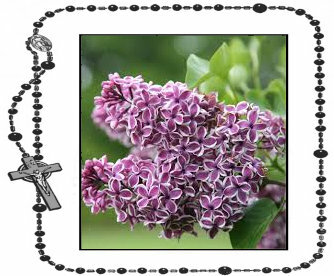 On the seventeenth day of May, the virtue is FIDELITY IN LITTLE THINGS with the corresponding flower being the beautiful Lilac. It is the little buds that group together in fidelity to the greater good God intended to emit the spring fragrance that is so pleasing to the olfactory senses. Lilacs grow in colder climates, meaning they go dormant - treat, if you will, so that toughened in the rough weather they can blossom ever more magnificently. So also with us. The more trials we face, the more we grow in grace and the more we will be faithful in little things, just as the holy Saint Therese of Lisieux (The Little Flower) practiced every day of her life. On the eighteenth day of May, the flower is the delicate LAVENDER with the corresponding virtue being MODESTY. This is appropriate, for modesty is the cornerstone of chastity and purity. Nothing makes Our Lady happier than a pure heart and a pure heart begins with being pure in the flesh. What we wear governs how we think; where we place God in our lives. Like the Lavender, our souls are delicate and to be immodest in any way or not to practice custody of the eyes puts that delicateness in jeopardy. Our bodies are temples of the Holy Ghost and we must strive to adorn these temples with layers of clothing that are pleasing to our Almighty Creator, not man. For the nineteenth day of May, the flower offered to Our Lady as Queen of May is the rugged HAWTHORN with the corresponding virtue being MORTIFICATION. This is appropriate since mortification takes being able to withstand pain and pleasure. The red-fruited hawthorn, consisting of dense corymbs of pink-red flowers, has stems and leaves with are densely covered with short, wooly hairs and must bear up under cold and windy conditions. That is why it is found in evergreen country where conditions are rough, for a lot of wind helps the weather-worn hawthorn to bloom. So also, mortification helps to toughen us in the face of temptation and the life of ease, allowing grace to blossom forth. For the twenty-first day of May, the flower offered to Our Lady as Queen of May is the bluish PERIWINKLE with the corresponding virtue being PURITY OF INTENTION. It has been said the best of intentions often go awry. One reason they do is because they may not be based on God's will. Through purity of intention, it is based on doing the divine will in all things. One reason the periwinkle plant is associated with this is because the periwinkle is a trailing evergreen herb with solitary blue or white flowers, often also referred to as a myrtle in the United States. The trail of good intentions, if followed in a straight line toward Heaven, will stretch further toward God. Those intentions which are not cultivated and cropped by living a virtuous life, will scatter every which way and gather cockle and thistles, thus becoming refuse to be cast into the eternal fires (cf Matthew 7:19). On the twenty-second day of May, the flower offered to Our Lady as Queen of May is the yellow BUTTERCUP with the corresponding virtue being OBEDIENCE. We must always have obedience to God and we owe allegiance to man only when man's directive is in full harmony with the ordaining will of God. 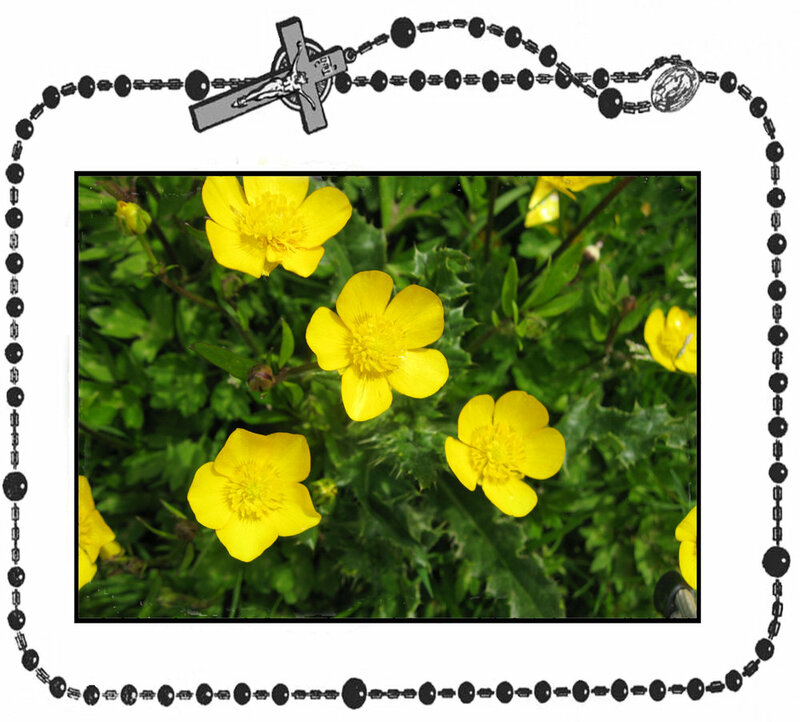 The buttercup, with its five petals and small, humble appearance, is a most fitting reminder of obedience for the 20 mysteries of the Rosary are divided into sets of five and begin with the Annunciation, which epitomizes obedience for Our Lady's fiat paved the way for the ultimate obedience to the Father with her Divine Son's Passion, death and resurrection so that salvation could be attained through the merits of Jesus Christ. What a wonderful flower to offer to the Blessed Mother. On the twenty-third day of May, the flower offered to Our Lady as Queen of May is the BLUEBELL with the corresponding virtue being DESIRE FOR HEAVEN. The delicate bell-shaped flower which grows on many continents and belongs both to the hyacinth and columbine genus, is symbolic of the church bells that clarion (religiously calls) souls to come to Holy Mass or to pray the Angelus. The reason for prayer is not for socializing, but for turning our attention to God and the purpose of desiring things not of this earth, but of Heaven. The bluebell's delicate shell chimes quietly in a whispy wind reminding us of God's call to focus on our end goal - our desire for Heaven, possible only through adherence to all Christ has taught and established in the One, Holy, Catholic and Apostolic Church He founded. It is a magnificent flower to offer to Mary, whose entire life was focused on a desire for Heaven and bringing God's children to that same goal. On the twenty-fourth day of May, the flower is the RED POPPY with the corresponding virtue being FERVOR. The hairy-herbed red poppy, though coveted for its opium by those who reject its beauty and look to use it for the means of mammon, emits a milky juice that has been used for authentic medicinal purposes to heal the body. 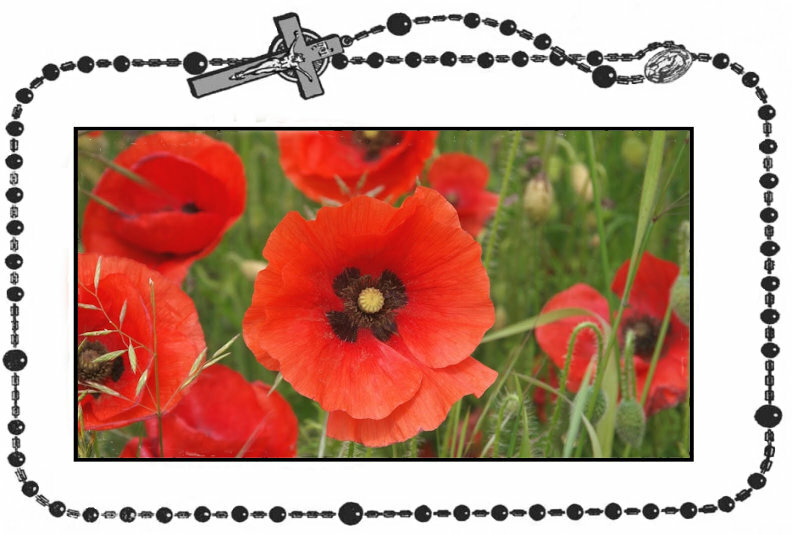 But it is the fervor of its elixir spiritually that drives the virtue of fervor to heal the soul and therein lies the true beauty of the red poppy offered to Our Lady in May. On the twenty-fifth day of May the flower offered to Our Lady as Queen of May is the Daffodil with the corresponding virtue being DEVOTION TO MARY. 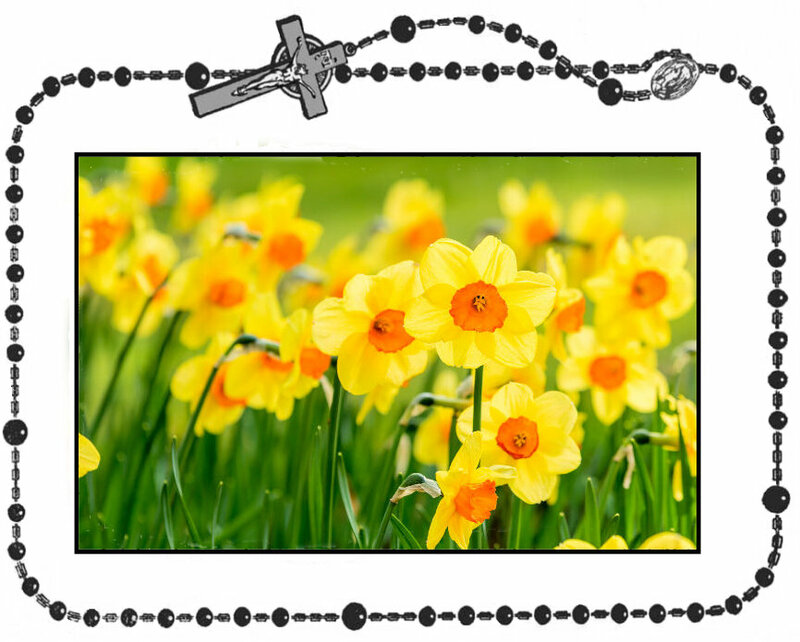 The lovely yellow or white daffodil signals the fullness of spring just as Our Lady's fulfillment of God's holy will signaled the fullness of redemption through her divine Son. Since she is the living tabernacle for the Son of God, it is only natural that we show her the very same respect Christ did and shower her with prayers of intercession and with spiritual daffodils in thanksgiving for what is the true "new springtime," the Passion, death and resurrection of the one Who conquered sin and death for us. On the twenty-sixth day of May, the flower offered to Our Lady as Queen of May is the PRIMROSE with the corresponding virtue being LOVE OF LABOR. Interesting that the primrose would represent the love of work for it is the primrose path which represents sensual pleasure and is most often associated with the path to perdition. Conversely it is the narrow and straight path to Heaven which foster a love of labor out of a sincere love for God and total humility. Perhaps the primrose, not actually a rose, is presented for it typifies the plenitude of multi-color flowers that are produced through tender loving care by the love of labor for it takes time and work to cultivate a garden of primroses. So also it takes time and work to cultivate virtue but the result is more colorful and splendid to the soul and to Our Lord and Our Lady than any flower, no matter how beautiful the primrose bouquets can be. On the twenty-seventh day of May, the flower offered to Our Lady as Queen of May is the VERBENA with the corresponding virtue of PRUDENCE. Bouquets of peachy-pink verbena, often grown in tropical and sub-tropical areas, are often mixed with the sacred boughs of laurel, olive or myrtle plants which are prized and intended to be cultivated just as the soul strives to manage itself by upholding all moral propriety and modesty, presenting itself before God as a victor over sin. 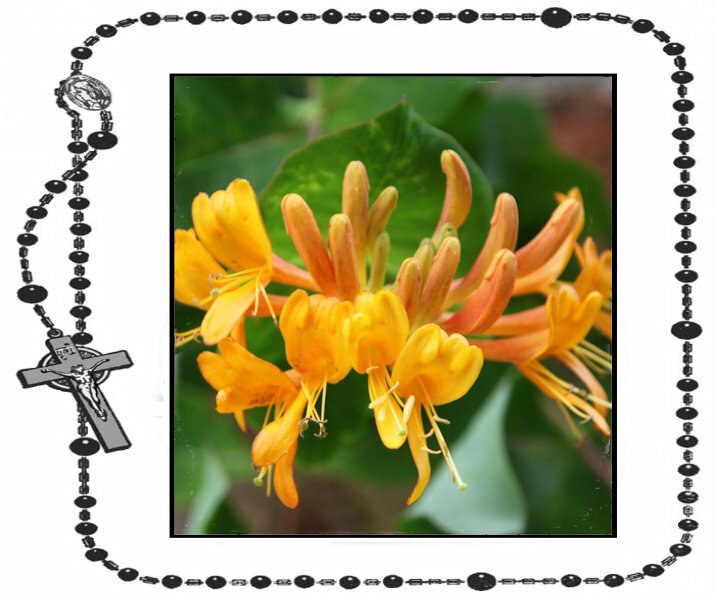 On the twenty-eighth day of May, the flower offered to Our Lady as Queen of May is the HONEYSUCKLE with the corresponding virtue of CONFIDENCE IN GOD. The honeysuckle, a member of the columbine family, is a sweet plant of long spurred flowers that resemble almost a trumpet-like shape, trumpeting the confidence in God. From the amazing floral display thus far in May, we can see the beauty He has created and this should spur on confidence in Him alone. Nothing; however, is more beautiful to His beautiful Blessed Mother than a pure soul arrayed in grace. On the twenty-ninth day of May the flower presented to Our Lady is the ASTER with the corresponding virtue being GOODNESS. The aster is named for the Greek aster which means star and the blooming herbs of the aster with the showy daily-like flowers blooms in the Fall, shining among the changing foliage which is losing its leaves. Appropriately, goodness shines through when others lose their luster. Goodness is what the Blessed mother cherishes so much in her divine Son's children for goodness is the foundation of a sincere heart and a pure soul. 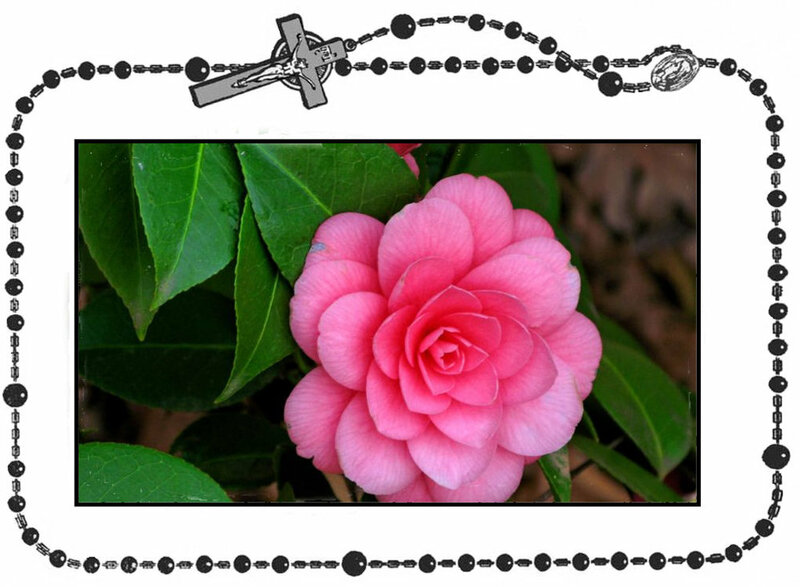 On the thirtieth day of May, the flower presented to Our Lady is the beautiful CAMELLIA with the corresponding virtue being PERSEVERANCE. This magnificent flower, which is a greenhouse shrub, is relatively a new find from the tea plant. In fact, its Latin name was derived after the one who discovered it and who practiced perseverance: the Jesuit missionary, Father Georg Josef Kamel, a missionary priest in Moravia. Perseverance also applies to the fact that there is but one more day left in this month of May to honor Christ by showering His Blessed Mother with bouquets of flowers and virtues. 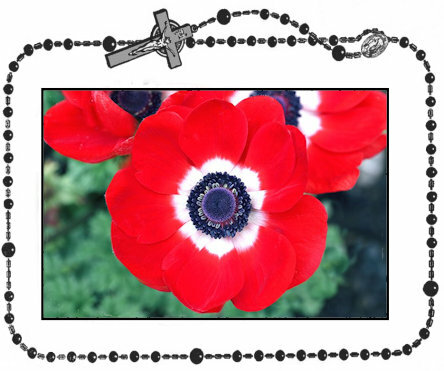 On the very last day of May, we offer Our Lady both the ANEMONE flower, which represents the beautiful virtue of UNION WITH JESUS, and the full bouquet from the full month. The anemone is a wood plant whose beautiful flower is renowned. Also well known is the fact Our Lady constantly encourages us to come to her divine Son and be united with Him through her. That is because He loves His mother and His children so and is so pleased when we honor her as He honored her during His life on earth and after in Heaven, where He, along with the Father and Holy Ghost, crowned Mary as Queen of Heaven and earth. That is why this last day is so special, for we take the entire bouquet offered through the month and offer them all to our Blessed Heavenly Queen with a bonanza of bouquets of flowers and the corresponding virtues that we have pledged to Our Lady to practice.